The aftermath of moving. It may sound bad, but I’m actually happy about my new home and how my move went. And TimeBank really helped. For me, the most stressful part of moving is packing, hands down. I connected with a TimeBanker (Ruth) who came over on 3 occasions and helped me stay on track with packing. She was a godsend since I’ve been known to stand for long periods of time with a single item in my hand, trying to decide which box to put it into, all the while my blood pressure rising. With Ruth there, I was able to keep moving forward. A dear friend, Theresa, who is also in TimeBank, came over the night before the move as well. Between the 3 of us we finished the packing and kept me calm. On moving day I had an amazing and unusual crew made up of a paid mover, a teenager, my daughter’s dad, my daughter (9), some friends who dropped by briefly, and a TimeBanker (Todd) who was willing to dive into my life and stuff for a full 6 hours on a super hot day. Todd was amazing. We finished unloading hours before I expected even after the required pizza break. I had also invited folks over for what I was calling #Cathy’sFlashMove and had hoped to meet a bunch of folks, especially neighbors. This did not work out as planned but I did meet one close neighbor (a TimeBanker) who arrived in time to help with a cleaning task that has made my first days here much nicer. So… help before, during and after my move, saving money, stress, and time. Wow. But just as valuable are the new connections I’ve made. I really like all of the folks who helped with my move and have already been in touch with or spent time with 2 of them. I hope to see the others soon. That’s not something I generally expect to get out of a move! With TimeBank you never know if what you need will line up with what someone has to offer, but it worked out for me this time and I am incredibly grateful. So despite the chaos in my house, I am very happily living in my new home with some new friends to boot! 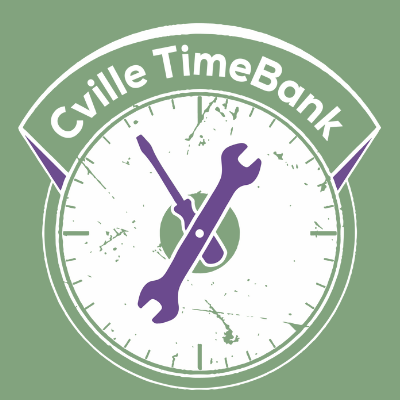 Next Next post: Twice Is Nice joins Cville TimeBank! Donate now – not all our expenses can be paid in timedollars! At a Repair Café, folks bring their broken stuff to be repaired by volunteers for free! Visit our Spring 2019 event on Saturday, March 30, 12:30 - 4pm at The Habitat Store on Harris Street. Click here to get updates by email.